At least 15 people have been confirmed dead in Gikomba fire which broke out at midnight. More than 70 have sustained serious injuries and rushed to Kenyatta National hospital, according to the St John’s Ambulance. The cause of the fire has not yet been identified as efforts to put it out are still going on. Speaking at the scene, Nairobi Regional Commissioner William Kang’ethe Thuku said that that the fire has been contained and investigations started immediately. “At 2.30am fire broke out inside a timber shop near the Nairobi River but it was contained two hours later. Four children who were rushed to Kenyatta National Hospital died on arrival,” he added. 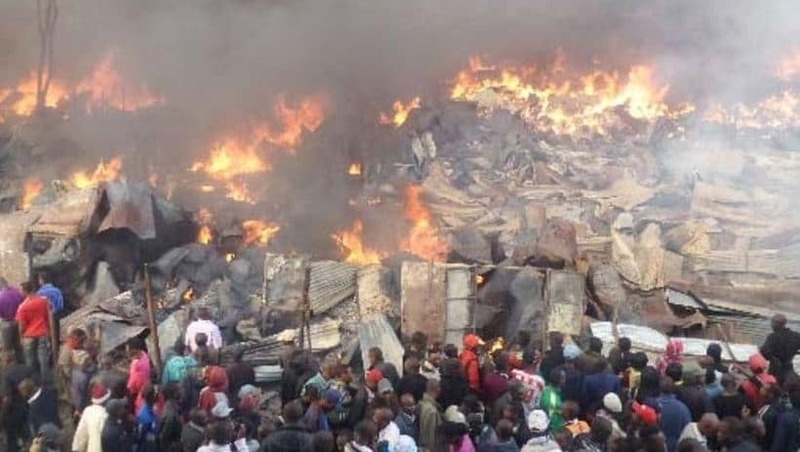 Speaking to Citizen TV, Makueni Senator Mutula Kilonzo Jnr said that the fire is as a result of negligence from the government to take serious safety issues in the open air market. The market has in the recent years experienced a series of fires, with the government always promising to investigate and take action, never to happen. “The national government will go there this morning and make many promises but nothing will come out of it. Continuous lip service,” said Kilonzo. Two years ago, after a similar inferno destroyed property worth millions, Kamukunji MP Yusuf Hassan alleged that the incidents were an attempt to edge out traders from the land. “I think it is not purely accidental. We have too many fires here. There are people responsible for them and we must find out who they are and bring them to book,” he told journalists. A year later, another fire broke out and this time round President Uhuru Kenyatta ordered that investigations be carried out to establish the cause.